Update 1.6 will include new idle animations for our Kerbals. How many can you spot? Author of Micro-Challenges for all, and newbie writer. Location: Earth, Sol system, Milky Way Galaxy, Observable universe, universe 1. Nice! Anybody working on moving around in IVA? Cool! I always thought that the Kerbals should feel more alive on EVA. I mean, real astronauts don't just stand perfectly still, do they? Would love to see if they would fall off gilly by practicing the high kicks. I'd love to see them do the little low gravity two-foot hop that Apollo astronauts used on the moon. 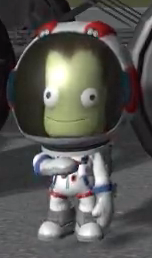 Be fun to see Kerbals hopping around and they''d move faster. By the way, some of these are hilarious. How fun! Wait is there a surface sample collection animation? How﻿ m﻿any can you spot﻿? I can spot not enough part revamps in this post. I was going to ask about that. There was a couple of sample-taking animations shown back in the pre-release days, but they were never put in the game and I don’t know why not. I’ll try to find them later when I’m not on mobile. If I get a chance, that is. Busy evening ahead. Maybe someone else will dig them up. but they were never put in the game and I don’t know why not. It's one of the conundrums of the universe. Along with the unused Porkjet revamped parts. There was a couple of sample-taking animations shown back in the pre-release days, but they were never put in the game and I don’t know why not. I always assumed it would make science gathering even MORE annoying by delaying the process to show the animation that you've already seen 500 times. New animations! Yay! I wonder if the Enhanced Edition will be updated to 1.6 (as we got a few hints in the last 'KSP Loading') Before you know it, we'll have KSP version 2.0.0! Hm, I don't know. Needn't be more cumbersome than the flag planting animation I think. 2-3 seconds? I can spot 10 Kerbals. Do I win something? Minecraft isn't at 2.0 yet and it passed 1.9 a very long time ago. Besides, 2.0 implies huge changes, the kind that we haven't ever seen done all at once. I'm skeptical Private Division and/or Squad will take the risk, since it will attract a lot of hype and if it flops, it will flop big-time. i didnt know i needed this so badly until i saw it! now my kerbals can look interesting when they are standing around! ok, they aren't that bad. wouldn't mind seeing something along those lines in the future. the last one I can see being used for KAS though. I'm ok with those mannerisms, but, loose the heart hold salute and the shaking hands mannerisms. One is political, the other looks like a medical condition. Neither have any place in this game. Maybe that's the Kerbal salute? Are we now removing all salutes from games? Goodness me. I'm so behind on the political landscape. It's not a medical condition. She's examining her hands and is shaking off the gross space gunk she sees on them. I have to say, this is quite the pleasant surprise! It really makes Kerbals more "alive," and less like astronaut statues. Small details like this add loads of character to the game, and recent updates seem to be full of them. Oh, and I suppose I can salute the animators now.